Well… everything started to get a little dicey on Friday evening. We were doing fine when all the sudden, we lost power in half of the house. Hmmmm. We checked the breakers and the big outside main breaker and nothing. Darn. So we called Steve… it’s one of those things. You know, when you’re a doctor, people gotta ask you about this pain and that pain at cocktail parties. Well, when you are an electrician, you get the call. He says, that is not good, you better call a residential electrician because he is an industrial electrician and it’s getting a bit past his knowledge over the phone. So we call a fellow that we know who is a handy man, plumber, heating and cooling, electrician fellow. Oh, he’s also a minister. 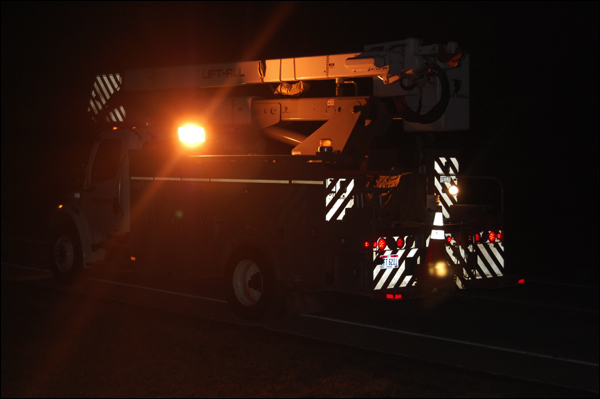 Well, he says, that sounds more like a Edison problem, you should give them a call first and see because it might not cost you anything if it’s their issue. Well that sounds good, so I give them a call and within a couple hours, they are out with the big truck. And pretty quick, he finds the problem. And it was not their issue, but ours! Ugh! 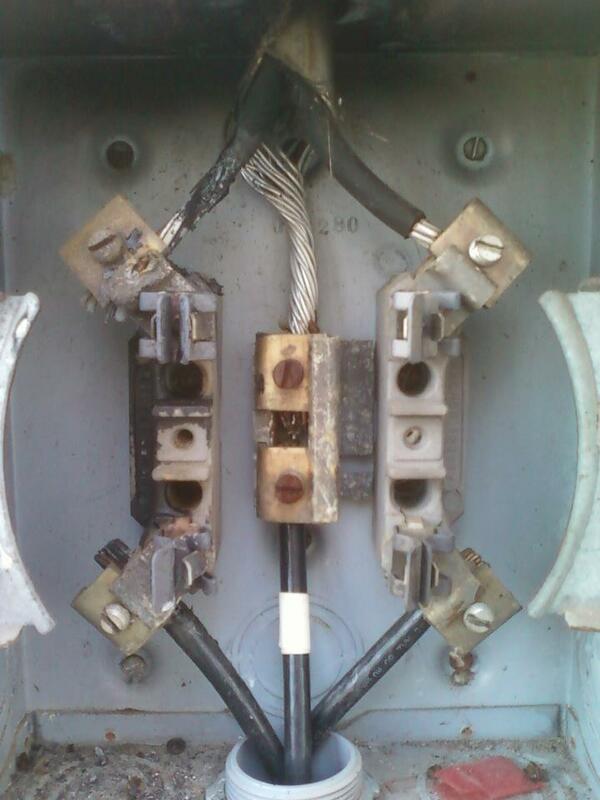 The meter socket had bust a move and burned up the whole left side! Which just happened to be our furnace, our water pump, our sump pump and the big office and our kitchen stove and deep freezer! Shesh… talk about the big boys. And Mr. Edison promptly goes and disconnects us from the grid. Says it’s way to dangerous and he’s sorry but hey, you don’t want to die in a house fire, now do you? Well, his timing could have been better. I mean… Saturday night? 12 degrees predicted? Snow? Gosh. Now what to do? My head begins to spin around and I think my heart might bust from all the stress of the last two months. Mr. Edison is sorry but he thinks it’s going to be pricey. But to call him as SOON as we get it fixed and he will rush over to reconnect us. Well, I call our electrician and he’s sorry but he’s at a banquet and can’t get away until Sunday afternoon after services. But he won’t charge us any emergency fees if we can wait till then. He tells me that he’s pretty sure it will be at least $500 to $700 bucks. I feebly say okay… and call my friends to see if we can slumber party there the night. Of course, they are fine and we trundle down with pillows and snacks and laptop. We have a nice time, just hanging out, watching tv and all. They are sure the best, let me tell you. We considered going to a hotel to swim in the pool and pretend we were on vacation, but they were all pretty expensive and we just couldn’t justify it, not staring this huge unknown bill down in the next day. Besides, slumber parties are good fun! We got up the next day, lingered a bit till everyone was ready to face the cold house and chores and then went off to get the critters all fed. We didn’t have water at the farm, but thankfully, everyone had water in their buckets and such. I thought we were going to have to take a trip to the spring but we made do with what we had stored. The house was unbelievably cold… at least 40 degrees, but still.. COLD! We cranked up the two kerosene heaters to start warming up the studio and we went and got Chinese food from our new fav place for lunch. Well, our neighbors call and their brother knew of a more local fellow that was super good and reasonable and was available! I felt bad to cancel out on the minister electrician, but when I called him, he was fine with it. Said it was a blessing and that he had more than enough to keep him busy… he had just got a no heat call from an elderly couple and he would go to help them! What a nice man… I was thankful that he was not upset at all. The new electrician was out within 30 minutes and said, yeah, he was thinking about $400 to $500… better. Sort of. Well, we said okay and he got started. The girls were so cold and bored that they both crawled in their warm beds with their dogs and were soon napping away the afternoon. 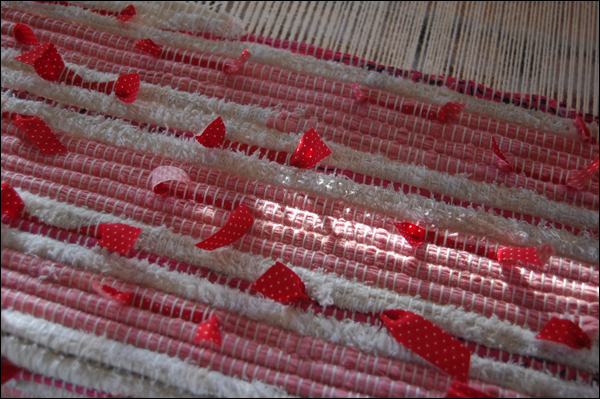 I was in the warm studio and I started to do a little weaving, working on this lovely fun Valentine’s rug that I started a few days ago. Problem is, I wove for awhile but then I ran out of the sewed strips! Waaa! I was not about to start hand stitching them together, so I instead got out my knitting. Even with the kerosene heaters going, it was still pretty cold in the house, in general. I really wished that I could crawl in my bed as well, but there was too much going on. So I got the battery radio out of the screen porch and found batteries for it. 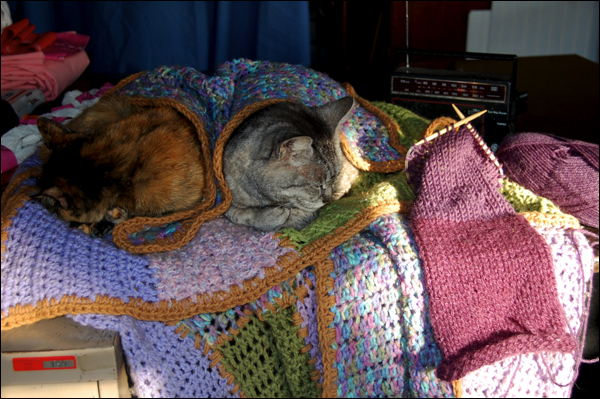 (It plugs in as well, so we had used it that way) And the poor kitties were just sitting there watching me and cold so I went and got an afghan for the studio table and pretty quick my kitty girls were snuggled up. You know it’s cold when kitties will snuggle together and don’t mind a blanket over them! Poor things. I’m sure they were cold last night… it was super frigid! Well, I got a whole sock done. One of my wooly hobbit socks. Just really a wool tube sock but they are super warm and soft in your farm boot, let me tell you. After a few hours, Louis, our new electrician was done. And then he says it went pretty easy and that he had a few parts left over from another job a while back so he gave them to me cheap… and says it will be $200! Oh my gosh!!! I was so happy, I almost cried! He told me that we need to fix one more thing out there but that it was safe to wait until it was warmer and he’d be happy to get it done. Probably about $100 or so. You can bet I will be giving him a call as soon as the weather is a bit nicer. Told me that it was just age and that it should be fine for a good long time. I gave that Edison fellow and call and he was out within an hour or so. And he was happy with the repairs and got busy. I was never so happy to see his big diesel in front of the house, purring away as he worked to get us back on. Everything came up nice and happy!!! We got the basement unflooded… of course, it had flooded since the sump pump was off for 24 hours. (There’s nothing really down there, it’s only about 8 foot by 12 foot in size! very small… And the furnace is up on several cinder blocks, so it was safe.) Got the freezer going, the furnace and water pump. The house was still really cold so we decided to drive a bit and go to Walmart and Burger King. Didn’t really need anything, just wanted to waste a little time to let the house warm up a bit! It was fun to just walk around with my girls and be silly in the nice warm store. By the time we got home it was warming up. We jumped in our beds and said our prayers and I was just so thankful for good friends, great electricians and heat, lights, water and internet! A friend asked if we felt that we were unaware of the costs that would be required for this little farm in repairs and such. Well, I got to thinking about it and even though, yes, we had to add a furnace, a new water pump, this electrical work, fencing… it was not that bad. About $5,000 total over two years. Sure there’s been lots of little things and livestock acquistition and all, cosmetic stuff, but hey, we are still so far ahead of the game and everything we do to the place just makes it more valuable and livable. It was a foreclosure in need of a lot of TLC and it will probably continue to throw us a curve ball now and then. But we just wouldn’t trade it for all the perfect condos or whatever in Florida. It’s home and we love it here. And we’re willing to work through whatever inconveniences that rehabbing this wonderful old place brings about. I think we’ve gotten through most of the big things so far… only real big issue is the septic system and we’ve had it checked and it was in pretty good shape. And we’re very careful about keeping it clean, no grease or anything like that, use a good septic safe toilet paper, and put those microbe packets in it as scheduled. Cuz when those things fail, it can be SUPER expensive. Can you say composting toilet??? Well, silliness aside, I hope we have earned a little reprieve from the technology curse upon us. I have come to very very much appreciate the modern conveniences that electricity and the internet bring to us. I am thankful for them and do not hope or wish for some terrible world event to happen that sends us into darkness. Because, I hate to tell you this, but it’s kind of boring after the initial thrill of it all. It’s hard to see a lot by candlelight. And it gets cold without a furnace. And well, we just all love the internet and it’s entertainment and educational value. I think I will keep the good parts of modern society while still enjoying and preserving some of the old trades and skills. The best of both worlds!!! So, that’s the story. All’s well that ends well. And today was a quiet, peaceful day. Thank goodness! Thank god you got it fixed this cold and wind is NO JOKE. This is why I plan to build a house with a simple wood stove in it as well as the industrial model that will go outside. That way, I can’t always have heat even when the power is out, no generators, no panic, just go toss on some logs. Rather then what I have now, which is a mobile home where I can hear the plastic on the windows sucking in and out in the 40mpr wind gusts. Ah, life in the country. Glad you guys are warm and happy now.